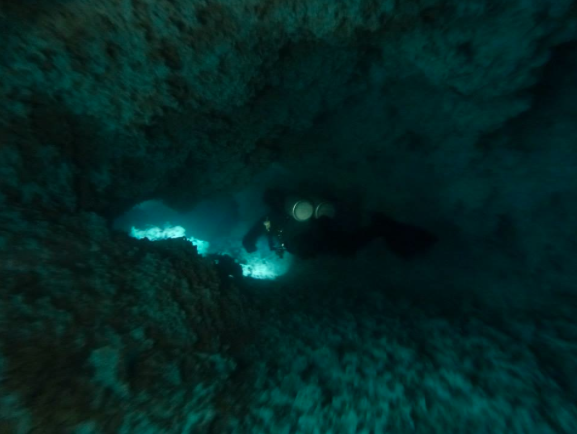 A couple of days back I took you on a diving adventure into the Mayan underworld. 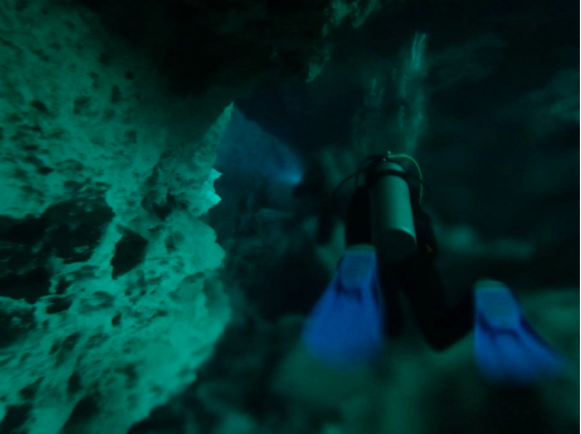 Together we explored the caverns of Casa and Grand Cenote and the hidden wonders within. 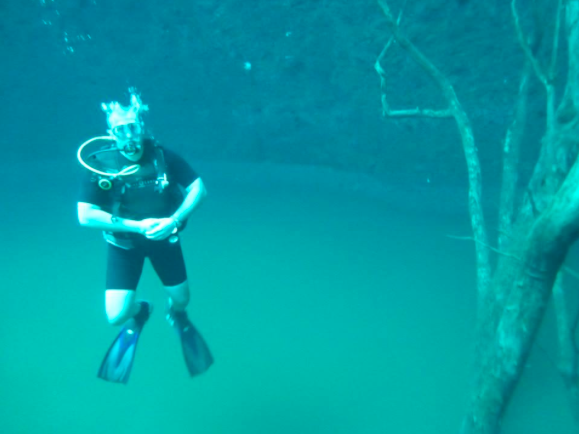 To avoid repeating myself, I am going to assume that you all know what a cenote is and understand that Mexico has no rivers or lakes due to the limestone rock. 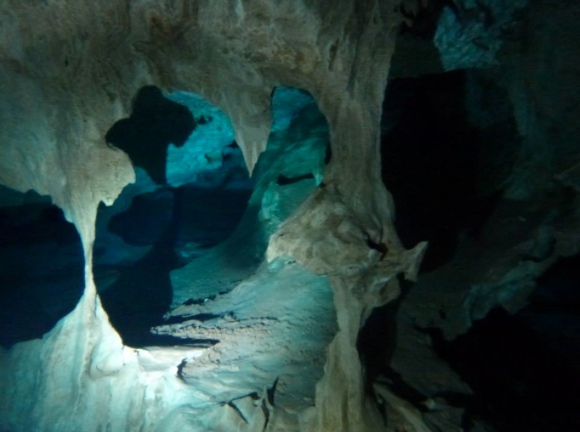 Instead, a vast network of underground tunnels connect a series of caves; a mixture of fresh and sea water which spans the length of the country. 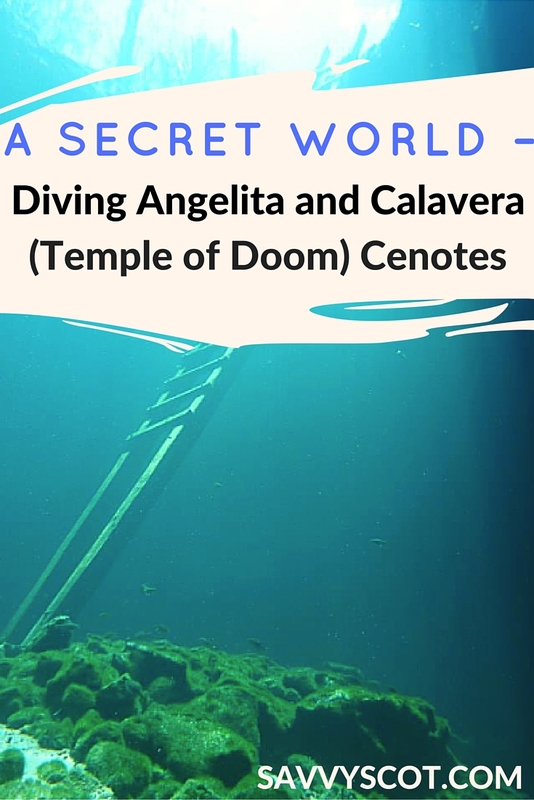 Before we traveled to Mexico, we had heard stories about Angelita being a ‘very special’ site. Upon Googling the name, a series of scary and mystical images appear – not your typical crystal clear well! 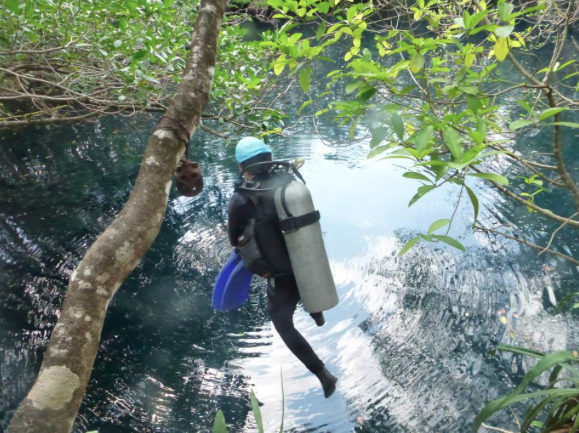 The cenote itself is not your typical converted tourist trap – there are no fancy staircases or easy entry points here. 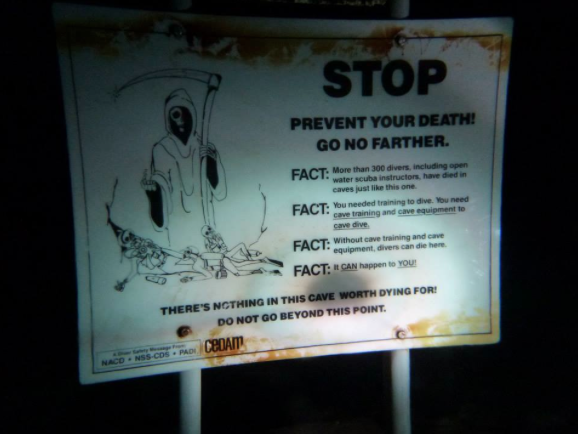 In fact, it is quite the opposite – the entry point involves an approximate 3 meter jump whilst trying your very best not to get eaten by mosquitoes! Unfortunately I made the mistake of boldly jumping in behind Mrs Scot with flippers, mask and camera in hand and forgetting to put enough pressure on my weight belt clip. 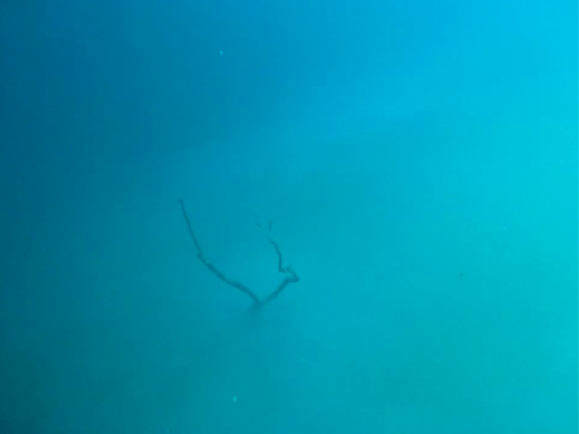 Without even realising, my 12lbs of buoyancy control were 60m below. OOPS! 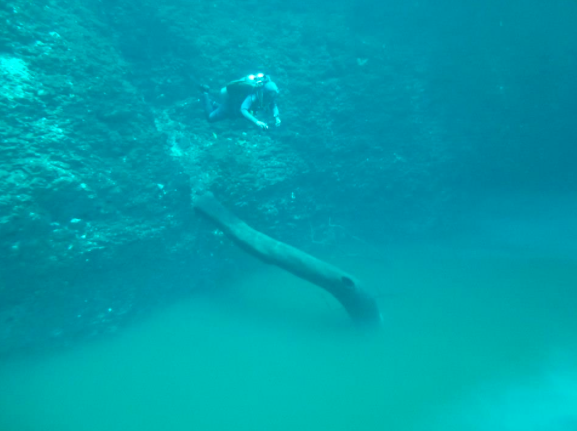 After diving the murky waters of Angelita, Calvera was a return to the crystal clear water of Grand Cenote and Casa Cenote. Although much smaller, the entry method was quite similar to that of Angelita – JUMP! The underground rock formations can only be described as spectacular. So prominent yet fragile with it! On first looking at the above picture, it appears slightly blurry towards the bottom. 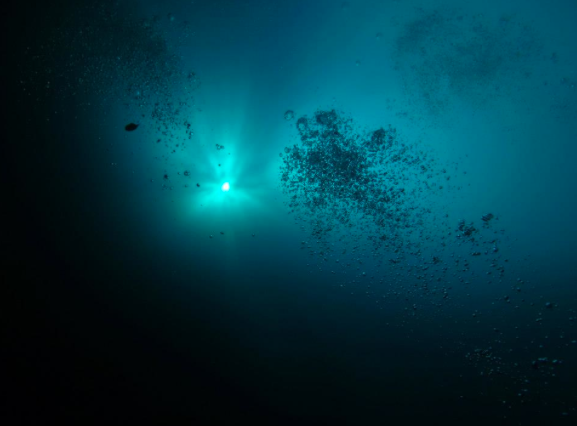 This in fact is a shot taken through a Halocline – an area where salt and fresh water meet. Great Shot! (even if I do say so myself)! WHY Is Calavera known as the Temple of Doom I hear you ask?! Is it because of the skeletons? 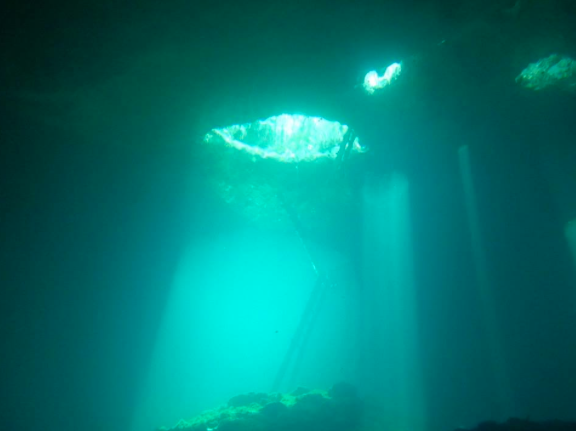 Or is it because of all the entrances to the underground cave systems that exist where many divers fail to return? Or maybe it is because of the bat skeletons that are littered on the cave floor? 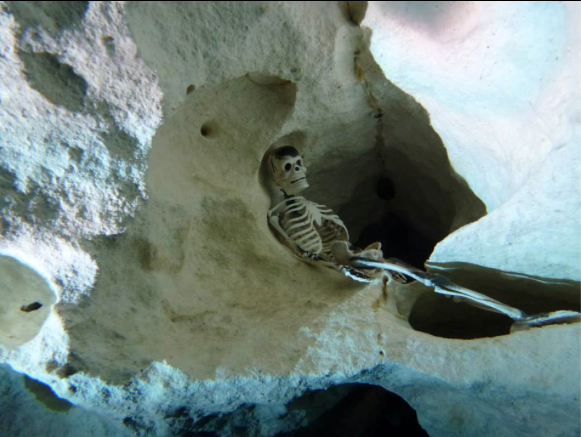 Well the real reason is that when you look up from the caverns below, the surface holes strangely resemble a skull…. In my opinion, it is absolutely stunning – What Do You Think? Holy. frickin. crap. THAT IS SO COOL!!! Amazing!! 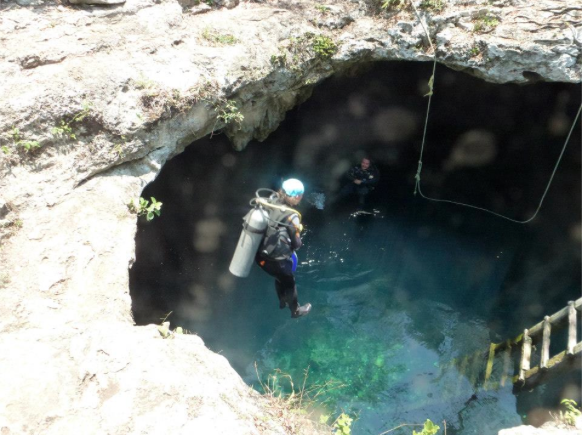 Did you guys smell after going through that layer in the first cenote? And the skulls…so creepily awesome. Yes Maam. I swear I could smell rotten eggs all day….. That could have been my over-active imagination though! Love the halocline shot. 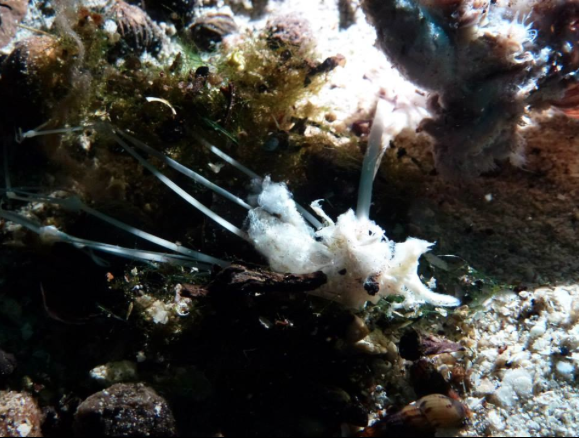 Makes me want to get back in the water right now!